I'm having issues with getting keyboard input to work. The IDE first compains about "CPU address error exception by code read access at 0000007F"
And lastly, I get error on the emulator screen. I've already stepped through the program and this is the affected area. When it gets to GetKey(&key);. I usually do higher-end stuff and I've got a lot to learn... so any help is greatly appreciated. This may be because the key variable is not initialized yet, can you copy and paste the code where you declare the key variable? If that was the case, the compiler would've stopped me immediately. I suspect something else might be triggering this. Edited by Raresh Nistor, 02 September 2018 - 02:48 AM. I have no idea, code looks good from the snippets that you showed me. and see if the error still comes out. Interests:Astronomy, electronics, computers, and of course, math. You have a variable labeled "key", and I am wondering why you would pass the address of (&) the variable key instead of just the variable key. I do not know the context that you are programming in, but typically absolute memory addresses are not passed around as function parameters. That could be what your IDE is complaining about, and what is causing the system error message about non-existent memory. If you are using the USB Power Graphic 2 model, you are not suppost to use the IsKeyDown function anymore. Use only GetKey and Bkey_GetKeyWait. To Todd: The key variable is passed as a pointer, hint passing its address. EDIT: Have you included the stdio library? This is the link to all errors. I assume the error you are experiencing is with the str variable. -Increase the amount str has. If none of that works, could you post your entire source code? It'd make it easier for us to debug it. Edited by GodOfCows, 03 September 2018 - 10:36 PM. The address of a variable is not exactly the same thing as a pointer. A pointer is a variable that contains the address of some variable. The above example is straight out of K&R. However, I know what you mean, because if you look at line 3 of the above code, ip and &x are kind of the same thing. So I am probably splitting hairs here, and that's rarely productive. It seems in the posted code that getkey( &key ) is telling getkey to read the key value from some i/o port named key. Is that the intent? Or, is the programmer trying to tell getkey() where to put the key value received from getkey()? At any rate, I haven't written a legitimate line of C/C++ code for a decade, and much of the low-level i/o stuff is compiler implementation dependent anyway, and I know nothing about Casio libraries, so I will bow out. Edited by Todd, 04 September 2018 - 08:00 AM. I would say the latter. I assume that when GetKey is called, it waits for a key to be pressed and the returns the keycode to whatever address was passed. I don't have any books with me at the moment, but I am fairly confident that you are still passing key's address to GetKey. But looking at the code, it would traditionally run an error, because the parameter are not being met for the GetKey. I've never used it in the way you describe, and I don't have a windows computer currently with me to test. Edited by GodOfCows, 05 September 2018 - 12:37 AM. Edited by GodOfCows, 05 September 2018 - 12:39 AM. Sorry, that was just example code showing a typical usage of getkey() in most of the implementations of C I have used, and not meant to be compiled. 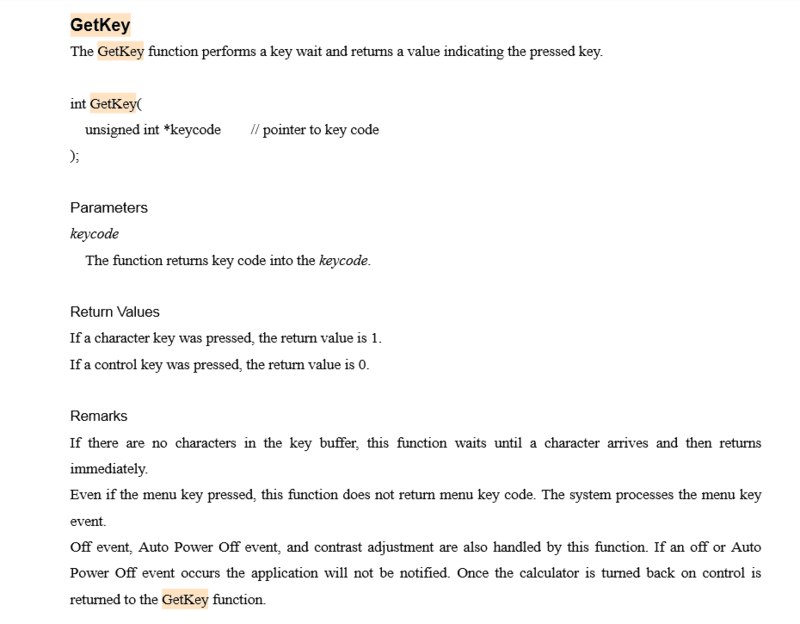 Having read Viliami's post from the Casio programmer's doc, the function prototype clearly shows getkey() wants a parameter that is of type pointer, and points to a variable to store the returned key code value. In the original error post, the programmer was passing the address of the variable to hold the key code. While it may be functionally the same, I wonder if Casio's compiler is strict on type checking? If it is, then he might be getting an error using the address directly. Perhaps he could try creating an actual pointer, assign it the address of key, and then pass the pointer. Another observation is that the prototype has a return of type int besides putting the key code into the passed key code location. Since the original code is not using an assignment statement when getkey() is called, I wonder if that is triggering his compile-time error. -In the original error post, the programmer was passing the address of the variable to hold the key code. While it may be functionally the same, I wonder if Casio's compiler is strict on type checking? If it is, then he might be getting an error using the address directly. Perhaps he could try creating an actual pointer, assign it the address of key, and then pass the pointer. GetKey() returns a 1 if the button that was pressed is numeric and 0 if the key is a control key, which don't make a difference when it comes to execution. I'm unsure how picky the compiler is, but what Raresh Nistor has as source code on his original post wouldn't cause an error (*BUT* the IsKeyDown() function is no longer supported, so he needs to remove them as they may be causing the first problem "CPU address error exception by code read access at 0000007F".